is disc 2 out in September then? and has the Garibaldi segment been dropped for disc 4? i don't know any of this because i have tried to stay as clean as possible, this has meant all i have heard concerning any of it is bits and pieces thus have no idea when the next section is coming. Yeah, sorry Ranger1, Jan is right, didn't mean to cause any undue excitement there, I just meant I have to wait til September 3rd (as far as we know) to see this first disk because I live in the UK, but thought I would chip in anyway because the discussions are so interesting..
EDIT: And today I see the listing has finally appeared on amazon.co.uk with the September 3rd release date apparently confirmed!!! http://www.amazon.co.uk/Babylon-5-Ta...144923&sr=8-14 Although it seems you still can't pre-order it yet, and there's no pricing..
Last edited by RMcD; August 3rd 07 at 12:45. Wow, I'm shocked anyone Aetheist would think the Lochley episode took the side of Religion. Looking at it through an Aetheistic prism, I thought the episode showed very clearly that God is not a certainty. The "Demon" never said the name God, the Priest did, and the "Demon" merely went with it. The Priest talked about how venturing into space has eroded faith in God. How come people can't see that Lorien (or any other big, bad ancient race) could be the roots behind the Faith of God. Looking at it from through my own personal views of Faith (but, not belonging to an organized religion, and completely against "Fire and Brimstone" religion) it seems to me, it would be more likely that Fundamentalists would be upset at the fact the episode suggested that God could just be an Alien that a myth was built around, even the Priest himself, the way I read it was sturggling with his own Faith, and I didn't see that change, especially after Lochley gave the "demon" the slap down, and proved you don't have to be a Theologen to get the better of a "demon"
I thoroughly enjoyed the first episode, it was very Twilight-zone-ish or like an episode of A Haunting. There is every reason to believe, in my mind that JMS was slyly slamming religion and showing it is just mythology created by someone who didn't comprehend an Alien visitation (and the prior history we have with the Vorlons appearing as Aliens to manipulate us, proves that point to me). At the beginning, when the priest asked Lochley about her Faith, I didn't get the impression he was trying to verify she was religious (she called him for an Excorcism for Christ's sake). I thought he was asking her in order to ensure she wasn't a Fundamentalist Fire and Brimstone Whack job that was going to look down on him. Last edited by Sindatur; August 3rd 07 at 14:23. I'm agnostic, and I in no way see any attempts being made to force religion or proof of God on me. What I did see were characters in a story having their respective perspectives. I never assume a characters' perspective is the ultimate statement of reality about a situation. What is not forced down the viewers' throats is a blatant spelling out that the demon is an alien. We don't need all the characters running around barking "he's an alien, not a demon" all over the story in order to understand that. For some reason it seems some people do need it, but that's not a flaw in the story. Can you please very precisely quote that line? I don't remember that being stated at all. What I do remember was the priest saying that there had been plenty of people over the years who had hoped that eventually science would find some indication of intelligence if they looked smaller and smaller enough into particles, but that nothing had ever been found, and that that lack of finding proof had caused more and more loss of faith over the centuries. They specifically address the change in smell within the priest's proposed hoax hypothesis. The priest comments on the significant power of suggestion, and that's only one possible means that would enable a change in smell, or temperature, that would still allow it be a hoax. Do you really need to be shown every option? I don't think there's time for that. When was there ever a mentioning that this possessive demon had a physical form? I would think the very fact that this being is possessing someone to try to escape from Earth shows that it doesn't have a physical form. Perhaps because despite the characters considering the situation with the potential for God's involvement, what humans believe about God and what the reality in the situation of this possessing "demon" being bound to Earth as imprisonment are not the same. Just because the "demon" says that God bound it to Earth and the characters consider that possibility in no way equates that with the reality of the situation. jms said no such thing. All we got for certain was a human figuring out that a being that claimed to be a demon was a being that was bound to Earth, and in being bound to Earth would then logically be destroyed if Earth was destroyed. What's with the assumption that a character in a story's beliefs = jms's personal beliefs? No, one does not. One just has to be able to not take every little thing at face-value. 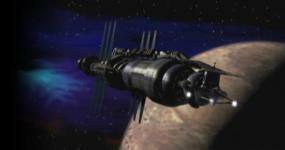 Babylon 5 has had a lot of action in it over the years, but it never was an action-story. It was always about the characters -- what they think, believe, hope, and feel. It was always about making choices, and the consequences of making choices. And that's exactly what we got in TLT. Last edited by vacantlook; August 3rd 07 at 14:20. Nicely put. Very nicely put. Can you please very precisely quote that line? I don't remember that being stated at all. . There was a sentence about some scientists 'trying to soften the blow' by saying that the movements of some small particles seem to indicate purpose, I think. I'll have to check when I get home. But it's still just a character expressing something. What's with the assumption that a character in a story's beliefs = jms's personal beliefs? Yeah, isn't that kind of like saying that since he writes about Narns and Vorlons that he thinks they really exist? I've seen people in the past say that JMS couldn't write as well as he does about religion if he doesn't believe. Not so. He understands the religious impulse from having experienced it but no longer believes. Having experienced it, he can write about it honestly when it's appropriate for his characters but that doesn't mean he actually believes in gods or demons any more than he believes in First Ones or Shadows. Waitaminnit Jan, are you now trying to say JMS doesn't believe in First Ones or Narns? Sorry, Sindatur. I thought you already knew. It's a blow, isn't it? Yeah. Some of you may have missed the 'fiction' word in science fiction. You cannot have everything explained to you in life in such exact terms in order to enjoy it, or you will not get very far. Those that quibble on this really missed the point, IMHO. What is important here is what the characters themselves belived about the situation, how it affected and tested the personal faith of Lockley and the Priest. Faith has always been a key element in the B5 mythos. This story handled it very well. I've just finished reading Dan Simmon's Hyperion quartet, which tackles faith and Christianity in science fiction. This had a nice echo of some of his arguments. It reminded me of the S2 story where the very demonic servant of the shadows possessed Murdoch from the A-Team. No one had a problem with that instance, which until the very last line from G'Kar could have been an equally 'super-natural' story. Re: Legend. Boy, I think you really missed the point about the second story here. Let me start with 'that one evil kid'. He was a teenager who was the son of Cartagia and people were out to kill him. He would obviously be a bit jittery and have some issues. Well written and acted, IMHO. Sherridan killing him without giving him a chance to redeem himself (or even actually do something more evil than just mouthing off, the lad never did anything wrong) would be totally out of character, as would Sherridan killing him just based upon what Galen showed him. Sherridan would want to see real evidence for himself, that is integral to his character. It is also why he chose to 'adopt' him and keep him close, and obviously what Galen intended all along. For me, it really was the best B5 since season 5 ended, Crusade included. I've watched it 3 times and will do so again when I finally get the R2 disk. I laughed a lot. There were funny lines, but humour is a subjective thing. If you did not find it amusing, fair enough, but it is something I will deny, despite what you say. Legend, you and I obviously have very different ideas about what a 'babi' is. For me, it was always more than effects and action (although i like that as well) and about characters I love dealing with new situations in ways true to them. I fear you have made the classic critics' error of dissing something for not containing what you wanted it to rather than commenting on the merits (or lack thereof) of its actual content. Last edited by darth_librarian; August 3rd 07 at 16:20. "Devil's Due"; it was rerun on Spike yesterday. He wasn't possessed or about to be possessed. He was being toyed with before being eaten. Yes, I know he didn't actually get eaten. Ok, ok. I hear what you all are saying about this possession. But, there were still many non-ambigious references to the devil and God, despite this possession possibly not being religious at all. The story was too preachy for me; very speculative. It was just non-stop, with no breather in between religious discussions. It just annoyed me personally and my girlfriend as well who is a non-practicing Jew. Nothing seemed that ambigous nor did anything really be left up to the viewer to decide for themselves. It appeared very matter-of-fact. Some of you have mentioned not to take it for face value and look deeper but the straight foward dialogue made that hard to do. It just turned me off. That's all. And I know others have said similar things, but I just needed to get this off my chest. And I believe it WAS that one line that stated "scientists have concluded that there has to be some kind of "intelligence" "that really set me off and was the last straw for my patience for this plot. I don't remember the exact line but it's was pretty much that. You can say what you want but when you bring my scientists into this, and put words like this into their mouths, that's where I draw the line. And that's why I got so upset. Again, the Sheridan story was better but just seemed very anti-climatic with the warm and fuzzy ending. I still stand behind my previous comments on killing the kid. Just because its a kid should not mean anything. If this kid was trully evil and was intent on killing billions then maybe the galaxy would better off without someone like that. I could use Stalen or Hitler as reference here but then I'm sure people would say that if someone showed them some love when they were a kid, then maybe they would'nt have done what they did. But sometimes you just can't change people and nature shows us that every day. And looking at his father who was clinically insane, chances are there was little hope for this kid. And I do not believe it would not have been that out of character for John to perform this dark task. For God sake, if you remember how he hijacked a ship and put lives at risk in "Call to Arms" based on Galens's premontion and about as much evidence as he had here. I know I'm in the minority here seeing as how most of you liked it while the rest were ok with it, but I just saw nothing that resembled the kind of entertainment that the series or any of the other movies provided . It was not thought-provoking nor visually engaging (except for Sheridan in the Star Fury-that was sweet). But they did'nt even really show the celebration at all in the end which seemed to have been lead up to. I just saw too many problems and I usually don't pick apart movies and just appreciate what the had to offer. But again for me, this did'nt offer up too much so I had no choice than to be overly critical. I waited so long for this; you should have seen my eyes when it showed up on my door step. And I don't even think that my expectations were too high cause I had be reading what you've all been saying, so I was prepared for a mediocre movie. Do you really feel this movie comes even close to the kind of quality story that "In the Begining" gave us? But whatever, life goes on and hopefully they'll be many more TLT movies that show off what JMS can really do with creative dialogue, funny characters and with hopefully a few action sequences thrown in (in space or not). Last edited by legend; August 4th 07 at 00:15.